Mark Hofeling has designed and art directed over 50 productions for film and television. He began his career in film during his teenage years, and has gone on to design for over 20 Disney Channel Originals, including the made-in-Utah High School Musical trilogy. We had the pleasure of speaking to the talented production designer, who generously shared his experience working in the industry and offered further insight into his career to date. Did you always want to be in the entertainment industry? M: I knew I wanted to be a production designer at 8 years old. I realize that’s an oddly specific thing for a lad of single digits to say, but it’s the truth. My dad took me to see Star Wars on opening day in 1977. He leaned over and said, “Somebody makes all that, you know”, and my brain lit up. I knew creating the world on the silver screen was what I had to do. 10 years after that, I walked on to my first movie set and I was on my shaky way. M: My childhood was spent toiling in dumps and construction refuse sites gathering building materials for a dream project that my hoarder father never bothered to share with his boys. We eventually had mountains of rotting plywood and lumber stacked adjacent to Interstate-15 around 4500 south. It was a monument to a pathological level of thrift and several childhoods worth of uncompensated toil. In the spring of 1988, an art director in town to make Halloween 5: The Revenge of Michael Myers, spotted our debris field and saw what he needed to build a crumbling shack set for his movie. My father traded a few truckloads of his precious dry-rot for me having an opportunity to meet with the art director. I ended up working for him as an art PA (production assistant) for 3 deliriously happy weeks. At the end of that time the shooting crew showed up, and our mountain man’s shack glowed with blue and amber light in the smoky night. It was heaven. I followed this art director to Wisconsin later that year for three low-budget, but amazing, horror films produced by Fangoria magazine, then came back to Salt Lake, packed up my VW and spent a few hungry years in LA trying to gain experience and build the beginnings of a resume. Can you tell us about your experience, both living and working in Utah? M: Around 1993, I figured it might be cheaper to be poor back home in Utah, than being poor in LA. I returned and had the crazy luck of getting a cold call from Don Schain, then gearing up to produce the first of the Leucadia company’s low budget family films in Utah. We ended up doing more than 20 films together over the years. Those first 15 years or so back here in Utah were great. While rates were low, as were the overall production budgets, there was generally enough work to keep a scrappy young film professional like me busy for the bulk of the year. It was a great space to really sharpen my skills creatively and managerially. Leucadia eventually shut down after 9 or 10 projects, but that gave way to some really interesting work with Showtime and some independent productions. And then eventually the Disney Channel pitched a tent here and thus started a relationship that I have been fortunate enough to maintain to this day. Tell us about your experience working on the High School Musical trilogy? M: The first High School Musical appeared to be, from the perspective of the Utahns charged with executing it, another fun, 90-page DCOM script that we were happy to make. It wasn’t until Kenny Ortega blew into our production office like a summer storm that I realized this was going to be something really special. Kenny and I became fast friends, and he was kind enough to invite me to dance auditions, let me sit in on music meetings, choreography rehearsals etc. Having never worked on a musical nor having grown up with them (they weren’t a great fit with a plywood salvaging lifestyle) I was excited but unsure how all these disparate elements, in addition to the normal development of a film project, were going to come together. The first full musical number I experienced was ‘Stick to the Status Quo’ in East High School’s cafeteria. Seeing every element suddenly click into place so flawlessly I actually got chills. I was hooked! In that moment Kenny Ortega and the Disney Channel re-invented the movie musical, and I was part of it. Since that time, I’ve done another 10 musical films for Disney, and five more with the great Kenny Ortega, Including the blockbuster Disney’s Descendants franchise. But with the explosive success that followed the first High School Musical, it was a real delight for me as a designer and Kenny’s creative partner to make big moves in global pop culture – an opportunity I had not yet had in my young career. We spent the next two movies trying to top ourselves and deliver to a fanatically engaged worldwide audience. Within the heightened yet simultaneously simplified reality we had engineered, we found that we had license to leap out from the red and white punch of East High in almost any direction. I am extremely proud to have been part of that landmark series of films. How do you usually prepare for a project? M: The older and more experienced I become as a designer, the more I’ve learned to trust my initial instincts. The first time I read a new script I pay close attention to the mental images and creative hunches I have. After almost 30 years working this corner, I have a wealth of reasoning to trust my instincts. Once I’ve read and digested the script, I prepare to sell my impressions to the boss (the director), the rest of the creative team and, just as importantly, the people who write the checks. That process is building a bulk of research and preliminary sketches to sell the movie that I think we should be making. It’s great to have an idea, but if you can’t get it out of your head and breathe life into it for everyone else, then you might as well stay home. Because I often work outside of Utah these days, another big part of my prep is assembling a team to help me make the vision happen. That’s another area where hard experience has honed my instincts for reading people and sometimes taking chances on a person with perhaps a thinner resume but possessing a certain spark. That hasn’t paid off 100% of the time, but when it has it’s been spectacular. M: Maybe it’s just because it’s so fresh in my mind, but having seen the new Blade Runner just the other day I’m still reeling from it. It was obviously epic in scope and rich in its depiction of a world in the throes of environmental and societal collapse, but it comes to mind more because the story could not have lived without the visual and vice versa. That relationship exists in some extent in every film, but it’s that enmeshing of the visual AS the story that really sings to me. I think I’ve achieved that symbiosis in projects like Disney’s Descendants, but I definitely yearn to dig deeper and build bigger worlds totally from scratch like the creative team on Blade Runner 2049 did, and for that matter what the team on the original Blade Runner did as well. And because my natural instinct as well as more than a decade of work for young audiences lean toward maximalist design, I would love the challenge of something brutally minimal Like Nicolas Winding Refn’s Valhalla Rising or Jim Jarmusch’s Only Lovers Left Alive. At first glance these seem simpler than making huge musical/fantasy extravaganzas, but with so few choices to make, each choice becomes more critical. If you could work with / design for anyone or anything, who or what would it be? M: In addition to the sort of projects I mentioned above, one of my all-time favorite visual movies is Paul Schrader’s Mishima: A Life in Four Chapters. The work that he did with production designer Eiko Ishioka makes me crosseyed with envy. What I love about it is its fearless plunge into the conceptual, it’s daring theatricality. Obviously as a freelance creative I’m a hired gun willing to imagine and design just about anything for a price. But if there are any directors/producers out there with a super conceptual project in mind, call me! M: My first paying gig for Disney was when I was 16. 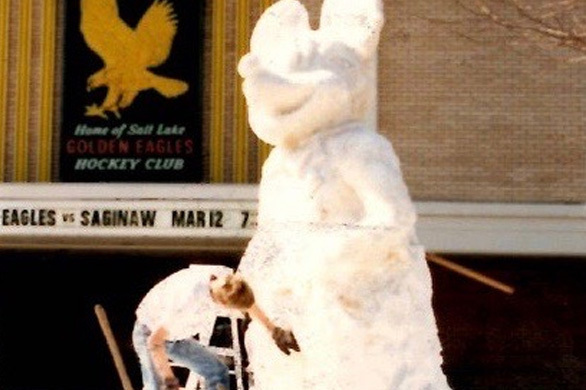 A guy from Disney on Ice spotted me at a snow sculpting contest and hired me to build a snow Mickey outside the Salt Palace. M: Be persistent and creative. Our once little movie powerhouse of a state is getting pretty beat up in the big money incentives game right now. Obviously, the Film Commission and groups like the MPAU are trying to elbow our way back to the adults table, but it’s been a lean few years. Until then, if you are looking to get your foot in the door, don’t be shy about directly contacting local people in the field you’re interested in and give them a reason to meet you, if even just for coffee. I think you’d be surprised at the response. Most film people love what they do, but tend to toil in anonymity. Someone reaching out to get advice will generally be well received. The film business rewards persistence and gumption, so show it. I always tell newcomers to be on time, be dependable, and be pleasant to be around for the crazy long hours we work. If you can master those three things, you’ve got it. To learn more about Mark’s work, visit http://www.markhofeling.com/.